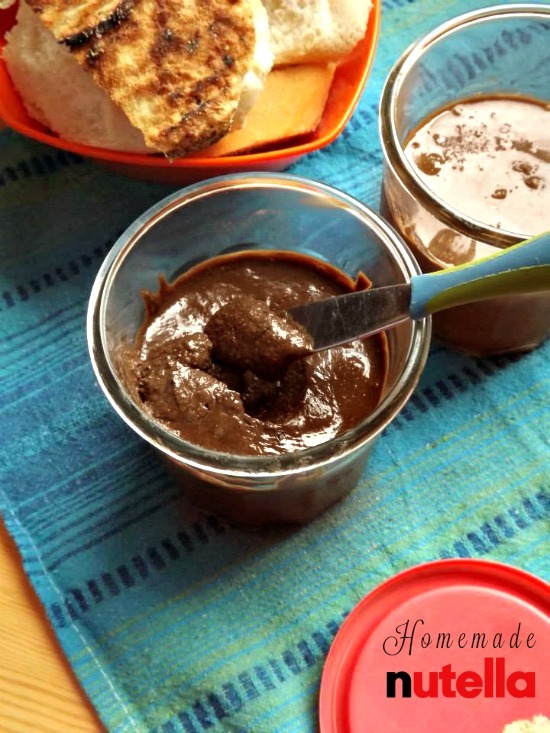 This homemade Nutella recipe is super easy and even better than store-bought! Marhaba - Welcome! If you're new here, you may want to subscribe to my RSS feed, check out what's on offer at theRecipe Index. Or join in on the conversation on the social network Facebook, see what's going on today on Instagram or even pin along with me on Pinterest. I mean hazelnut and chocolate is the most perfect flavor combination. It's a creamy dreamy spreadable chocolate YUM in a jar! I spent much of my childhood chummping down on Nutella crêpes and Nutella bread for breakfast. It was an addiction I took well into adulthood. Now living in North Africa, Nutella is readily avalible everywhere ... but well, yeah for a price I'm not too happy about paying. And unforunately, if you turn the jar around you'll find the ingredients that make up Nutella, ie: sugar and palm oil aren't so good for you. So still wanting to eat on a occasion all the time I thought I would try to make a homemade version that I can feel good about putting on the table. Don't use granulated sugar in this recipe as you'll only get inpleasant gritty taste.I think you guys are going to love this spread! This recipe is simple requiring just 6 ingredients and less than 20 minutes from start to finish. And did I mention healthy with real food ingredients and oooooh so ridiculously addictive eat-it-straight-from-the-jar delicious! BTW .... This recipe is a reader request! So thanks to everyone out there, all "my tribe" who have followed and supported me over the years. And especially those who I've shared a table with ;) If you have a recipe request or Algerian cooking related question, feel free to drop me line. Looking for another great non-nut spread? Try this homemade date paste, tastes like fruity caramel. Algerian soup? Don't forget something to spread your Nutella. Here's mega easy 10 minute dough, you can make bread, rolls, flatbreads ... really sky's the limit with this dough. So let's get started with the recipe. Preheat the oven to 175° C - 350°F. Spread the hazelnuts in a single layer on a baking sheet and toast them in the oven for about 10-12 minutes, until they’ve browned a little and the skins are blistered a little. Wrap them in a kitchen towel and rub vigorously to remove as much loose skin as possible. (Some skin will cling to the nuts when you’re done. It’s okay—not to mention inevitable.) Let cool completely. Don't grind hot nuts. In a food processor, grind the hazelnuts until they form a paste. My Kenwood MultiPro isn't that heavy duty, so I have found grinding them first in that machine, then regrinding them a second time in my coffee grinder gets me to the paste stage faster and without risk of damaging my machine. If you have a heavy duty kitchen machine like a Thermomix or BlendTec then you can easily do the grinding step in one machine. Add the oil, 1 TBS sweetener if using, cocoa powder, vanilla, and salt and continue processing until the mixture is as smooth as possible-or as smooth as you like. Add the melted chocolate, blend until well incorporated. Taste and adjust seasonings as needed, adding more salt or sweetener if desired. I usually like to add a drop of hazelnut essence to up the hazelnutty flavor. This is optional, not essential here. NOTE: Add your sweetener in 1 TBS increments. You can always add more. You can't take away. If your Nutella isn’t sweet enough, add another 1 TBS of your choosen sweetener. Just know the more liquid sweetener you add more loose and liquidy the Nutella will get, so add sparingly. Scrape your homemade Nutella into a jar or other resealable container and let it cool to room temperature. Cover the container after snitching several few spoonfuls. ⇝ The nutella will keep on the counter for up to 2-3 weeks for a softer spread or in the fridge if you like a more thicker, stiffer spread. ⇝ Try using dark chocolate here for another interesting depth of taste. ⇝ You coulc use vegan chocolate or use all cocoa (3TBS) for a vegan option.